Watch the video to learn more about the partnership between Laurier and Jusoor Syria. Wilfrid Laurier University is the first Canadian university to sign a memorandum of understanding with Jusoor Syria, a non-governmental organization dedicated to connecting Syrian youth with post-secondary education scholarships. Jusoor’s Canadian representative Leen Al Zaibak and Laurier Provost and Vice-President: Academic Deborah MacLatchy signed the agreement April 20. Jusoor Syria was founded in 2011 to provide educational opportunities to Syrian youth at a time when they are unable to undertake a post-secondary education at home. The organization partners with Oxford University, the London School of Economics and the University of Cambridge in the U.K., and a number of U.S. institutions including the Illinois Institute of Technology. Laurier will partner with Jusoor’s “100 Syrian Women, 10,000 Syrian Lives” scholarship program to sponsor four female Syrian students, three undergraduate and one graduate, to study at Laurier as early as fall 2016. The initiative is led by the student group International Students Overcoming War (ISOW) Laurier, which was established in 2014 to provide full scholarships to international students whose lives have been disrupted by violent conflict at home. 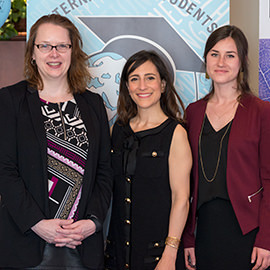 ISOW Laurier has already provided the funding to bring two female students to Laurier through a university partnership with Daughters for Life Foundation, an organization that offers awards and scholarships to young women of any Middle Eastern nationality, background or religion to study in Canada, the U.S. and the U.K. The scholarships are funded in part by a levy approved by Laurier students, which helped create the International Students Overcoming War Scholarship Fund. Gavin Brockett, an associate professor and co-coordinator of Laurier’s Muslim Studies option, serves as the faculty advisor for ISOW Laurier. Brockett’s first-year seminar on Israel-Palestine in 2013 and subsequent courses on global conflict and humanitarianism inspired his students to take action. "Students today are well aware of global conflicts and they want to learn more about the people who must live in the midst of these conflicts and to respond in a meaningful way,” said Brockett. “We know that Laurier students benefit just as much from engaging in this initiative as the students we sponsor. It is a powerful educational opportunity for which we are all grateful." ISOW Laurier President and fourth-year Global Studies student Annie Serez has worked with Brockett since 2014, and has led the effort to partner with Jusoor. Laurier has also recently supported a campaign to sponsor three Syrian refugee families.